First Data, the global leader in payments technology and services solutions, today announced a new seven-year, $7 million commitment to the Institute for Veterans and Military Families (IVMF) to fund education, research, training and opportunities for transitioning veterans entering the business community. This funding will directly support innovative programs designed specifically for transitioning military service members, and veteran and military spouse small business owners. 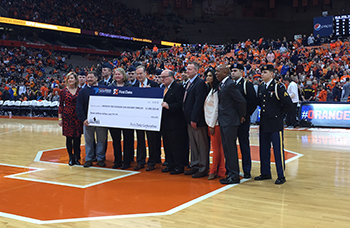 Representatives from First Data present the check for their $7 million donation to IVMF during the SU men’s basketball game against Duke on Saturday. The IVMF partnership is part of the company’s larger commitment to the military community as part of First Data Salutes, an initiative dedicated to making the company an employer of choice for veterans and military spouses, and a provider of a comprehensive suite of business solutions for veteran-owned businesses. In 2014, First Data’s veteran and military spouse new hires increased from 2 percent to 10 percent. In addition, the company, a recipient of the Secretary of Defense Employer Support Freedom Award, recommitted to a Statement of Support with the Defense Department’s Employer Support of the Guard and Reserve, reaffirming the company’s pledge to encourage increased hiring of service members in the Guard and Reserve. First Data Donates $7 Million to IVMF from Syracuse University News on Vimeo.